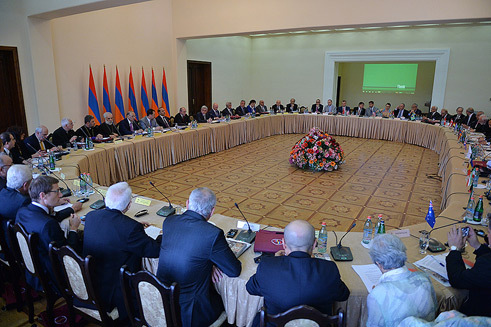 Yerevan, May 27, 2015 — The 24th session of the Board of Trustees of the Hayastan All-Armenian Fund took place today at the RA Government Reception House which was presided over by board president Serzh Sargsyan, President of the Republic of Armenia. Prior to starting the session, the board members observed a minute of silence in memory of their deceased colleague Eduardo Seferian (Argentina). After approving the session agenda and watching the film about the works financed by the Hayastan All-Armenian Fund during the 2014 accounting year, the board of trustees got down to discussing the agenda items, during which Ara Vardanyan was appointed as Executive Director of the Hayastan All-Armenian Fund for a three-year term, beginning on May 27 2015. The executive director presented the 2014 Annual Activities Report of the Executive Board. The board acknowledged the report taking into consideration the statement of the Audit Committee which was presented by audit committee member Vahe Chazmatarean and the representative of the audit firm, Emil Vasilyan. After presenting the statement, V. Chazmatarean, who had joined the Board of Trustees as an audit committee member since 1991, stepped down from his office and proposed, instead, the candidacy of Ara Aslan, in his words a younger, zealous and high qualified professional, which was accepted by the board. President Serzh Sargsyan thanked Mr. Chazmatarean for his long-term and useful activities and the dedication and adherence to principles demonstrated during his time in office and informed the board about his decision to award Vahe Chazmatarean the First-Class Medal of Services to the Motherland. At the meeting, the RA president handed over the high state decoration to Vahe Chazmatarean. 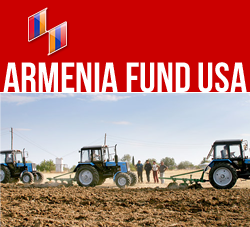 The Board of Trustees awarded the Certificate of Benefactor Membership to Andranik Baghdasaryan, Chairman of the Hayastan All-Armenian Fund U.S. Western Region Affiliate, who has so far donated around 900.000 USD for the fund’s projects. The next item on the agenda which pertained to the target of the Hayastan All-Armenian Fund’s Telethon 2015 was reported by NKR President Bako Sahakyan. RA President Serzh Sargsyan presented his observations with regard to the report and related proposals. “To start with, I am very delighted and proud of the fact that we managed to bring to life the resolution adopted at our session in 2013 and were able, in cooperation with the Pyunik Charitable Foundation, to transform the dilapidated building located in Komitas Pantheon into the Komitas Museum-Institute. We opened that museum in January this year, in parallel with the session of the State Commission on Coordination of the Events for the Commemoration of the 100th Anniversary of the Armenian Genocide, and I think that all of you had the chance to either attend that ceremony, or to visit the museum in thereafter. Those who have not done it, I suggest that you take a little bit of time to go and ascertain that indeed, that museum-institute could honor any country. Indeed, we managed to create an environment which is well-suited for that place and our great intellectual and deserves its memory, which will be of great benefit in terms of educating our youth, introducing tourists to our culture and of the development of Komitasology. All of us should once again thank the President of the Pyunik Charitable Foundation, Mr. Kabrielle Ghenberji, one of our board members, through whose disinterested donation this project was realized. I also have to add that on April 23 this year, the Supreme Patriarch performed a ground blessing service near the museum where we are starting the construction of Holy Martyrs’ Church again financed by a benefactor, Moscow-based businessmen Samvel Karapetyan, which will make that part of our city complete and will become a beautiful and a proper place for all of us. Secondly, I have to very briefly reflect upon the Genocide Centennial events. First of all, we are all aware that our board presidency agreed to establish a separate authority to manage those events, and that it became the main link to provide those events with legal and financial support. Both presently and in the past, those events have been financed exclusively through private donations. Many of our compatriots, this time mostly Armenian and Russia-based businessmen and organizations sponsored complete and large projects, from the global forum “Against the Crime of Genocide” to the commemorative event at Tsitsernakaberd, from the concert of the “System of a Down” band to the “Revival” benefit concert which was joined by more than 100 musicians from dozens of countries, and to the Canonization Service held at the Mother See of Holy Etchmiadzin which was sponsored by the Armenian General Benevolent Union. As you know, a few days ago, the Armenian pavilion won at the Venice Biennale, perhaps the most famous contemporary art exhibition. During these days, the whole world continues to witness exhibitions, concerts and symposiums, publication of new books and release of new performances. Likewise, today, as it should be, those programs need support, and, hence, I attach great value to everybody’s active involvement in their financing. And I also attach great weight to our compatriots’ keen involvement in those events. The Cannes Festival, which is starting in a few days, will be hosting the Republic of Armenia as its chief guest. During it, works of our composers, and first of all those of Komitas, will mainly be performed. I think that very many people visit Cannes as tourists, and if we combine that recreation with partaking in the given event, it is certainly will be more effective. During the next session, the authority in charge of the Centennial events will present to us in detail a meaningful financial statement, also presenting the necessary auditor’s report. This time we have chosen the following path: we have offered sponsors projects and their approximate amount and have also suggested that they themselves organize the given projects and fulfill the financial obligations with the help of reliable persons. However, I have to say that almost always we have had the opposite case, and after closely and with pleasure familiarizing themselves with the content of the project proposal, all of the benefactors have suggested that those resources be used by the authority and a subsequent statement be presented thereafter, something we will be pleased to do. In September this year, the week of Independence Day will be intensive with a number of events. It will finish on September 27 with the ceremony of the Blessing of the Holy Myron. Simultaneously, the 6th session of the State Commission on Coordination of the Events for the Commemoration of the 100th Anniversary of the Armenian Genocide will take place. On those very days we will certainly touch upon the benefactors, commission members and regional commission heads, who have spared no efforts to organize and hold the Centennial in the due manner. I emphasize this because we are going to hold some encouraging events on May 28 as well. We just want to sum up everything so that we can demonstrate a tailor-made and objective approach. We need some time for it. I need to inform you that at the end of the year, we will reflect upon all those officials who have taken part in those events and will honor them as well through taking encouraging measures. This is also driven by the fact that we are going to hold events across the whole year and do not consider that the Centennial events have finished. We still have major events. At least the previous events showed that our coherence and concerted efforts can produce unexpected results for very many people or almost everybody and can solve issues which are of vital importance to our people. I think that all of us will have the chance to fully analyze the work carried out throughout the Centennial not only to demonstrate the active involvement of people, but also to draw conclusions and to make next year's events more effective. The Centennial is not end in itself. We will make continued efforts until we achieve worldwide recognition,” said President Serzh Sargsyan.